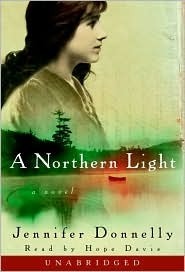 I've read a few books by Jennifer Donnelly now and she always impresses me but A Northern Light is my favorite by far. Mattie Gokey is a girl with potential but with little means to make something of herself. She lives in the North Woods with a bereaved father and three younger sisters. During the past winters, her father worked as a 'jack' in the woods but with the death of her mother from cancer, he feels he can't leave them alone so long. They barely get by on the little they produce on the farm, the milk and eggs they sell to the camps and hotels in the area open only in the summer. Hard times are made harder still when her older brother runs away. Still Mattie dreams of going to university in New York to become a writer. A dream encouraged by her teacher Emily Wilcox and best friend Weaver Smith. Circumstances arise that have Mattie working at the Glenwood, a fancy hotel for the sporting set of wealthy society. A couple, Grace Brown and her beau, go out in a boat one evening and never come back. Grace's battered body is found but there is no sign of the young man. Mattie holds the only clues to what happened in her possession, the love letters Grace urged her to burn. The story alternates between the day Grace's body is found and the previous four months of Mattie's life. Mattie contemplates how she's gotten to this point- engaged to be married instead of planning for New York. Poor Mattie, the odds just aren't in her favour. I suspect Mattie's story is the story of thousands of girls at the turn of the 20th century. Life was hard and every member of a family had a duty, especially girls without mothers. That Mattie even gets to go to school at her age at all is a small miracle. The burden of taking care of her family is a heavy one. The weight of being told 'no' to her dreams takes its toll and she begins to bend under it. Dreams aren't for girls like Mattie. A hawk's work, I thought, wondering if the robin had seen the brilliant blue of the sky and felt the sun on its back before its wings were broken. Isn't that beautiful? And so apt. Over and over Mattie sees that blue sky before being broken herself. Donnelly uses many literary references in A Northern Light like Dickens, Bronte, Dickinson but the one that stuck out for me was a brief mention of The House of Mirth by Edith Wharton. Mattie could be compared to Lily Bart, even though they have different lives they are both enslaved by their societies and buffeted about by circumstances. The question is will Mattie give up the way Lily does or will she fight for her dreams? Grace's death is a watershed for Mattie. Here is a young woman whose life has come to a sudden, brutal end- an end to all her own hopes for the future. A Northern Light is a coming of age story with a girl struggling to reconcile her family, friends, and beau with her dreams. About the audio: Narrated by Hope Davis. She has a nice young sounding voice but sometimes her voice had odd cracks that I found jarring. I really loved this one as well. I need to read more Donnelly! I really want to listen to this one after reading your review. Where did you find it? Oooh! So excited to hear you liked this book -- it's on my TBR list because I really liked her book "Revolution." This sounds fabulous! Donnelly sure has a great range, doesn't she? Mattie sounds like the kind of girl I love to root for. Teresa- I downloaded it from my library. I am such a Donnelly fan girl! I have enjoyed all her books that I have read. I've read such great things about Jennifer Donnelly and haven't read anything by her as yet..
knowing that it was one of your favorite audiobooks (mentioned in your other post) bumps this up for me. I'm adding it to my "for later" list! Haven't yet read any Jennifer Donnelly - we have REVOLUTION waiting on the shelf. This Audiobook Week is great - I'm adding many audiobooks to my wish list ... including this, which may be my first Donnelly read/listen. I haven't read anything by Donnelly yet, I have heard positive things so far. Can't wait to see what good little finds you found on Etsy soon.